On behalf of the Watertown Police Foundation Board, we want to express our incredible gratitude for all of the members of the Watertown Police Department (WPD) who responded to the tragic Boston Marathon bombings and assisted in the apprehensions of those responsible. We are so proud of our men and women who put their lives on the line in such a professional, heroic and relentless manner, to make our city, nation and the world safer. At WPF, we are also humbled by and deeply appreciative for the worldwide swell of support we have received in response to the events of the past weeks – both your expressions of thanks and pride, as well as your financial contributions. Your support and kind words are being shared with our Board as well as with the Watertown Police Department. Please do not hesitate to contact us if you have any notes you’d like us to pass on to WPD, or donation-related questions. 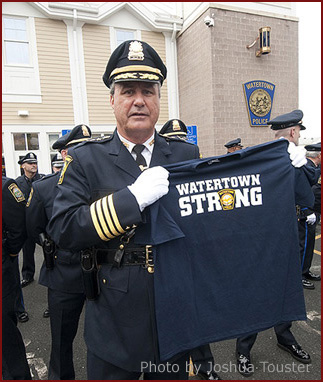 Help us to honor them with a "Watertown Strong" T-shirt or a Calendar!